Neovasc Inc. | Clinical Reports - Reducer, refractory angina treatment - Neovasc Inc. The COSIRA (COronary SInus Reducer for Treatment of Refractory Angina) trial: a prospective, multicenter, sham-controlled, randomized, double-blinded study assessing the safety and efficacy of the Reducer in 104 patients in Europe and Canada. Trial Highlights: The COSIRA data demonstrated that patients treated with the Reducer achieved a statistically significant improvement in the Canadian Cardiovascular Society (“CCS”) angina grading scale scores (two classes or better) compared to those patients in the sham control arm, (p-value = 0.024). Patients treated with the Reducer were 2.3 times more likely to see an improvement of two classes or better in CCS score than the sham control arm. The analysis also demonstrated that patients treated with the Reducer showed a statistically significant improvement of one or more CCS classes compared to the sham control patients (p-value = 0.003). The study also demonstrated a 96.2% technical success rate and a 100% procedural success rate for Reducer implantation. The final results from the COSIRA study were published in the New England Journal of Medicine. To obtain copies from the publisher click here. Coronary Sinus Reducer Stent for the Treatment of Chronic Refractory Angina Pectoris: A Prospective, Open-Label, Multicenter, Safety Feasibility, First-in-Man Study. 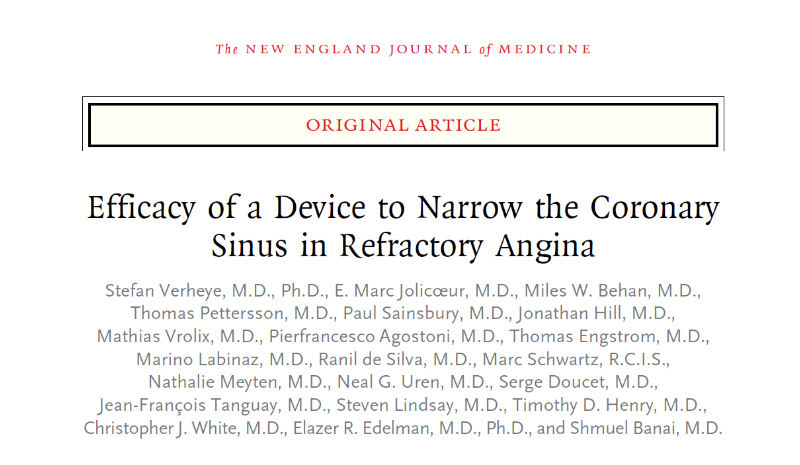 Fifteen-patient study demonstrates the safety and feasibility of the Coronary Sinus Reducer™ for patients with refractory angina who are not candidates for conventional revascularization procedures. Read abstract from the Journal of the American College of Cardiology.